An exclusive investigation by the Manchester Evening News has exposed failings at England’s biggest health trust. The MEN’s special report reveals a string of long-term failures at Pennine Acute NHS Trust, which runs North Manchester General Hospital, Royal Oldham, Rochdale Infirmary and Fairfield General. The report includes revelations that a third of the trust’s children’s beds are being shut after inspectors warned of unsafe nursing levels, and a staffing crisis at North Manchester General’s A&E. Hospital workers have told the paper of "appalling" understaffing and bad management in the department - and in other parts of the trust - that have led to more and more experienced health workers leaving, to be replaced by expensive bank and agency staff. The paper's social affairs editor, Jennifer Williams, led the investigation and delivered a piece to camera as part of the online coverage. The exclusive report will also be covered extensively in print tomorrow, with nine pages of coverage planned. 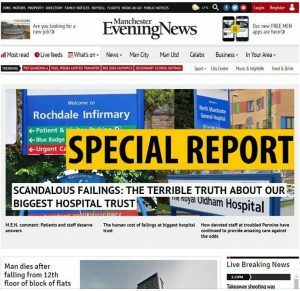 Rob Irvine, editor-in-chief at MEN Media, said: "The problems the Manchester Evening News has exposed across a wide range of health services are a cause for huge concern. "The superb investigative work done by MEN Social Affairs Editor Jennifer Williams has put this crisis firmly into the public's consciousness. "Today's coverage is just the beginning of a process during which we will hold NHS leaders to account and ensure people get the standard of health care they are entitled to."